A portrait of Pluto (foreground) and its largest moon Charon, taken by an instrument on board the New Horizons spaceprobe. Pluto and its largest moon, Charon, posed for a solemn portrait taken by NASA's New Horizon's probe, which is only two weeks away from its close encounter with the dwarf planet. 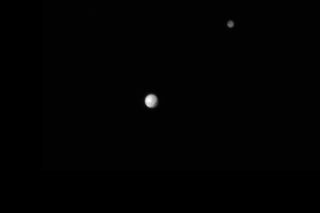 The newest snapshot of Pluto and Charon shows two icy gray circles hovering in a pitch-black void. In previous images, the two objects often looked like highly pixelated smudges of color — barely distinguishable as spheres. But with New Horizons only about 10 million miles (16 million kilometers) away from Pluto (and closing that distance by more than 30,000 miles, or 48,000 km, every hour), the view of these unexplored worlds is getting clearer every day. New Horizons launched in January of 2006 and has spent the last nine-plus years making its way toward Pluto and the region of icy bodies beyond Neptune, known as the Kuiper Belt. Although four other human-made probes have ventured past the orbit of Neptune, none have done a close study of Pluto and its moons. Even the Hubble Space Telescope's images of this small, dim dwarf planet are highly pixelated and blurry. New Horizons hopes to reveal a detailed look at the surface of Pluto, study its atmosphere and much more. The new portrait of Pluto and Charon was taken by the Long Range Reconnaissance Imager (LORRI) instrument onboard New Horizons. These images are not only for scientific and aesthetic purposes, but also for navigational ones, according to a statement from the Johns Hopkins University Applied Physics Laboratory in Laurel, Maryland (mission control for New Horizons). With nearly 3 billion miles (4.8 billion km) between them, it takes about 4.5 hours to send a signal from the Maryland control center to New Horizons, Bowman said. As a result, team members have to tell the probe what to do (such as which instruments to point at Pluto) long before the probe actually does it. When the probe makes its close flyby of Pluto on July 14, the team will not be able to make any last-minute adjustments. Instead, New Horizons runs prewritten command sequences, most of which were written years before they were executed. The command sequences must also indicate where Pluto is located relative to the probe, and thus where New Horizons should point its instruments. The New Horizons team has been constantly updating that navigational information as the probe moves closer and can obtain more precise information about Pluto's location. Earlier this month, the team executed a course correction to ensure the spacecraft didn't arrive at its close encounter point too early; that kind of miscalculation could cause the probe to take photos of empty space instead of the dwarf planet, researchers said. The full portrait of Pluto and and its largest moon Charon, taken by the Long Range Reconnaissance Imager (LORRI) instrument on board New Horizons, and released on June 29. In the next few days, Bowman said, the New Horizons team will be uploading the command sequence that will guide the probe through its historic flyby. There's also a possibility that the team will execute another course correction. "And of course [we'll be] getting down lots of science data, optical navigation data," Bowman said. "It's going to be great."